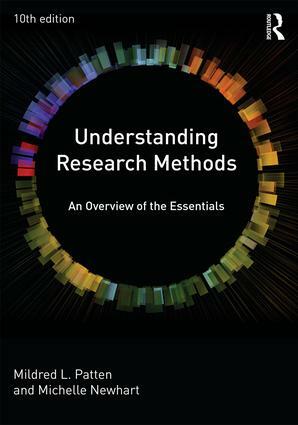 A perennial bestseller since 1997, this updated tenth edition of Understanding Research Methods provides a detailed overview of all the important concepts traditionally covered in a research methods class. It covers the principles of both qualitative and quantitative research, and how to interpret statistics without computations, so is suitable for all students regardless of their math background. The book is organized so that each concept is treated independently and can be used in any order without resulting in gaps in knowledge—allowing it to be easily and precisely adapted to any course. It uses lively examples on contemporary topics to stimulate students’ interest, and engages them by showing the relevance of research methods to their everyday lives. Numerous case studies and end-of-section exercises help students master the material and encourage classroom discussion. The text is divided into short, independent topic sections, making it easy for you to adapt the material to your own teaching needs and customize assignments to the aspect of qualitative or quantitative methods under study—helping to improve students’ comprehension and retention of difficult concepts. Additional online PowerPoint slides and test bank questions make this a complete resource for introducing students to research methods. Topic-specific exercises at the end of each section now include suggestions for further steps researchers can take as they build their research project.